Just reading the posting by 69hurstolds parts running out during conversion would of been a never happened as parts production quotas would include extra parts for parts catalog stock, defective parts found before assembly, parts damaged during assembly. Then for the older crowd, an example of ending production due to lake of parts look at the '77 Can Ams. The rear spoiler mold got damaged & GM cancelled the car. Another thing to think about is that rear window should of been the same as the one used on NASCAR cars. The 2+2's did have SOME options that they weren't supposed to however. My 2+2 has a pinstripe in red/orange that matches the 2+2 lettering which runs down the fender, door, and quarter body line. It might be dealer installed? The other option I have seen is drivers power seats. That seems more realistic as I thought they had a RPO tag with the power seat code. GM has, at least for a long time, spouted the "GM reserves the right to add, delete, options or modify content without notice...blah blah blah" or such language therein. If they added a stripe option and it didn't make it into the literature when they started, it's possible any changes could have been by memo or other means of communication. GENERALLY speaking, if a car in the GP line had a certain factory option then it likely would be available to a 2 + 2. While you can never say never in the stuff that slips by the QC inspectors, the weird things are rare and USUALLY are found during a dealer inspection and fixed on the spot. Maybe. Back in the 80s I guess you had the best chance of getting something f'd up from the floor up. The more I think about this car the more BS it seems. Really. Reason I say this is that GM PAID that company for *** number of cars. They had to be up to snuff to GM specs, and if they weren't, they didn't deliver them. If this indeed happened, someone would have lost their job, and every car magazine out there would have covered this with the higher ups. I don't believe this horseshit about running out of parts and then building a half-*ss car. Planners don't plan job orders or send the cars through if they don't have sufficient quantity of all the conversion parts on hand to do the job orders. That's part of the production process long before the cars arrive. If they ran out of key parts, they ran out of cars. The fact that the car may have left the conversion facility as an aeroback, and then was reconstructed later to a notchback by someone else seems more plausible. Documentation isn't noted with a pen and ink addendum to a request. I have never heard of any of the GM historical entities that dealt with helping owners ID their cars send a mommy note to explain how they ran out of parts. If that were true, they'd have documented that with a typed letter on letterhead. GM does NOT run out of parts when they produce cars. This doesn't mean they don't have production delays or cancellations DUE to lack of parts and such (the mid 80s Corvette rear fascia debacle comes to mind) but they have never to my knowledge have simply sent a car missing key parts to the dealership and put their name on it. I do grant you that quality back then made for some poor *ss examples, but something like what is being claimed just didn't happen. Someone change my mind. Give me some documentation, interview from GM press release, etc., or official something to tell me these bastardized cars were supposed to exist. Speaking with my friend who worked in the parts department at the local dealer at length, he was able to clarify further and this may make a lot of sense and lends claim to your statement. Obviously they did not sell as well as they thought... He said they sold only ONE in bubble glass form and the rest sat on the lot for more than a year. Finally GM allocated funds and parts to convert them to standard glass car. At that point they were able to sell them. (I don't recall it being that long a time frame, but I guess it was already into the '87 model year when this happened... ) It could have been as I was always drooling over new G-body cars. Makes you wonder what became of all the take off 2+2 spare parts.??? GM had a habit of not shipping them back. They would get destroyed. My father's 2+2 has a rear window defroster because by law it had to in NY State when sold as a new car. Just want to clarify that in no way shape or form am I dissing the 2 + 2's. I think they're sharp looking and if I didn't love Olds so much I'd probably have me one. It's just I think the "ran out of parts" story is fabricated. 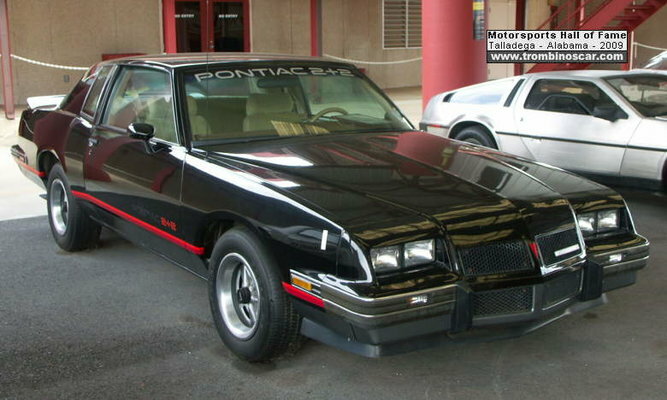 The car in question reminds me of car that I seen in person back in 1988, it was a 1986 Grand Prix GT. Black in color it had the same interior as the 2+2 black window trim even the wheels where 15 inch but it didn't have the front end of the 2+2. GM never made this GT it was a dealer that converted them. I just couldn't remember the dealer but i do have a magazine that i kept since 1989 thats called Modern Muscle Cars that shows that GT. The rear wing looks the same on GT and the car in question. I remember back when the aero cars came out (now, I feel old, thanks), and the backlash against them. They were very polarizing; love them, or hate them. 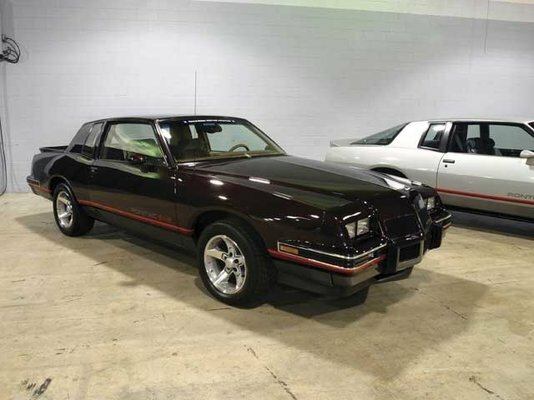 I have no doubt that there were dealer conversions (Cutlass GT comes to mind) or customer transplants of aero noses and wings onto regular coupes. I'd even let the burgundy one slide as an FX since it has no VIN, BUT, factory production, I think not. I ran across this in one of my GM NPN books, most likely there's more information on the 2+2 just too many pages to look at. The Grand Prix GT that 84 W40 posted above was dealer conversion done by Myrtle Motors, a now defunct Pontiac dealer in Middle Village NY. I posted the original sales brochure in the literature section a while (years...) back. 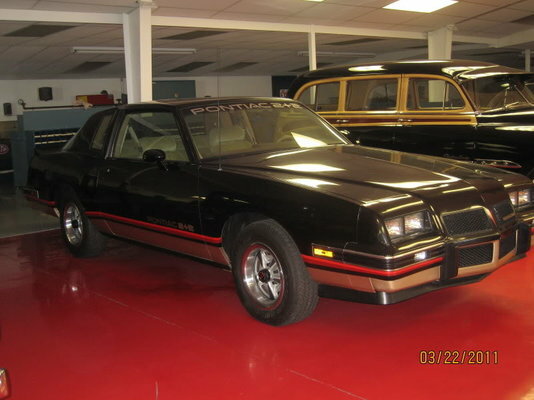 You can find it here https://gbodyforum.com/media/categories/pontiac.8/ Basically just a blacked out GP with a 3.73 gear, 15" rims, GT emblems from a Sunbird, 82-85 Firebird pedestal spoiler and a hood tach. They build a handful and they surface on the internet from time to time (look on youtube). To the best of my knowledge, there are three 2+2 prototypes still kicking around, all of which started out as 85 GPs with a tan interior, and none of which have production VINs. I've seen all three in person. First, the burgundy car that was linked in an earlier post which is the only notchback of the three. The car was part of the GM Historical Collection until 2009. At some point in the early 2000s it was given a fresh paint job in the original color and 16" S-10 wheels (it had 15" Rally IIs on it originally). GM was still bringing this car out to various Pontiac car shows along with other cars from the Historical Collection well into 2000s. It was auctioned off by GM in 2009 and has been across the block 2 or 3 times since. The other two known prototypes are both black and have the bubble rear window. One is at the International Motorsports Museum at Talledega, and the other is at the Richard Petty museum in Randleman NC. The car at the Petty museum has the lower body painted light gold, while the one in Talledega is painted grey below the stripes. Another difference between the three is that the burgundy car and the Petty car have LE trim interiors, while the Talledega car has a base trim interior just like the production 2+2 did.